Newcomers to any market have a disadvantage in trying to eke out some market share from big, long-entrenched players, especially if they’re debuting a multi-component system. But in the case of high-tech, there’s an advantage – you don’t make the same mistakes that are part and parcel of any evolutionary process involving technology. You have 20/20 hindsight. You take a new approach that’s, fresh, sleek, streamlined, flexible and cost-effective. That’s exactly what Cisco Systems Inc. did recently, when – as TMCnet reported – it debuted its new computing model and data center architecture package. The Cisco Unified Computing System is, of course, based on industry standards. This interesting, holistic model is based on integrated management and a “wire once” unified fabric along with a standardized computing platform to optimize virtualization, reduce data center total overall cost, and provide dynamic resource provisioning for increased business agility. You end up with a single system that links blades and both “de-silos” and brings networking functions LANs, SANs, visualization, etc., into a single conceptual and functional scheme. By unifying various disparate components into a single footprint, fewer cables are needed (just one can go into the center, in fact) as well as fewer cables and switches, so you can cut the total cost of ownership by about 20 percent in capex and up to 30 percent in opex. With this announcement Cisco has also now invaded the blade server space. Basically, as Cisco itself says, they’ve taken a “clean slate architectural approach” to data center infrastructure. 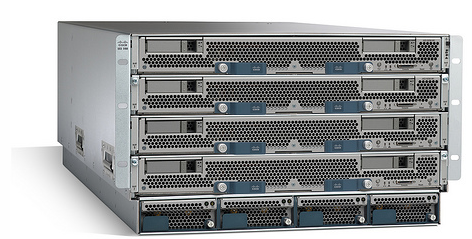 It’s new class of computing system incorporates the new Cisco UCS B-Series blades (pictured right) based on the future Intel Nehalem processor families (the next generation Intel Xeon processor). The Cisco blades offer extended memory technology to support applications with large data sets and allow many more Virtual Machines per server than was capable with previous processors. This announcement is yet another increment in the evolution of Cisco’s data center portfolio and Data Center 3.0 strategy. To help customers accelerate the transition to the Unified Computing architecture, Cisco is attempting to clear a path by offering a wide-ranging suite of new Unified Computing services. Even Cisco couldn’t do all of this alone, and it has announced some collaboration with industry leading companies (BMC for management software, VMware for visualization, Intel, etc.) on the Unified Computing System and architecture. The new Unified Computing System increases scalability without adding complexity: managed as a single system, whether it has one or 320 servers with thousands of virtual machines. It also improves energy efficiency and therefore reduces power and cooling costs. It also supports a unified fabric over a low-latency, lossless, 10 Gigabit-per-second (Gbps) Ethernet foundation. This network foundation consolidates what today are three separate networks: local area networks (LANs), storage area networks (SANs) and high performance computing networks. This lowers costs by reducing the number of network adapters, switches, and cables and by decreasing power and cooling requirements. The Cisco Unified Computing System also relies heavily on virtualization, thanks to VMware. Cisco security, policy enforcement, and diagnostics features are now extended into dynamic virtualized environments to better support changing business and IT requirements. It provides consolidated access to both Storage Area Networks (SANs) and to Network Attached Storage (NAS). Support for a unified fabric means that the system can access storage over Ethernet, Fibre Channel, Fibre Channel-over-Ethernet or iSCSI, yielding both choices and investment protection. IT staff can also pre-assign storage access policies for system connectivity to storage resources, simplifying storage connectivity and management, and helping to boost IT staff productivity. Management is integrated into of the system components, enabling the entire solution to be managed as a single entity through the Cisco UCS Manager, which itself provides an intuitive GUI, a command line interface, and a Application Programming Interface (API) to manage all system configuration and operations. Cisco UCS Manager enhances IT staff productivity, enabling IT managers of storage, networking, compute and applications to collaborate on defining service profiles for applications. Service profiles help to automate provisioning and increase business agility, allowing data center managers to provision applications in minutes instead of days. In addition to the partners mentioned, Cisco is collaborating with an open ecosystem of industry players to help stimulate technology innovation, augment service delivery, and accelerate market adoption of Unified Computing. The Cisco Unified Computing System and associated services will be generally available to customers starting in the second quarter of 2009. Richard Grigonis is Executive Editor of TMC’s IP Communications Group. To read more of Richard’s articles, please visit his columnist page.